With the month of March looming, United States tornado chasers are already watching the Southeast as a nasty storm brews with the potential to spin off a batch of tornadoes. But if funnel clouds develop Thursday or Friday as some forecasters believe, they won’t be the first. This tornado season got an early and deadly start in late January when two people were killed by separate twisters in Alabama. Preliminary reports showed 95 tornadoes struck last month, compared with 16 in January during a particularly stormy 2011. The season usually starts in March and then ramps up for the next couple of months, but forecasting these storm seasons is even more imprecise than predicting hurricane seasons. Tornadoes are too small and too short-lived for scientists to make seasonal predictions. They don’t develop like blizzards and hurricanes, which are easier to project. They pop in and pop out. The storms that give them birth may last only a few hours. Hurricanes and blizzards are lumbering beasts that spend days moving across the satellite maps. When a hurricane approaches, coastlines get days warning to evacuate. With a tornado, if the weather service can let people know 20 minutes in advance, it’s considered a victory. It takes a piece of debris only a few seconds to fly around an entire tornado; it takes hours to circle a hurricane. But tornadoes, though smaller, can have stronger winds. Since 1950, there have been 58 tornadoes in the U.S. with winds exceeding 200 mph; six last year alone. Only three hurricanes have made U.S. landfall with winds more than 155 mph. And forecasters are telling the Southeast and heartland to get ready again. “It looks like this week we’re moving into a slightly more active dynamic pattern,” said warning meteorologist Greg Carbin at the National Weather Service’s Storm Prediction Center, also in Norman, Oklahoma. The percolating Southeastern storm is proof of exactly how hard meteorologists have it. On Tuesday evening, Carbin said, “We’re kind of expecting it to be a fairly significant event” and the storm center’s website had a small red swath for potential severe storms with tornadoes. By Wednesday morning, the storm center’s forecast was much less clear. While the storm looks bad with potential for tornadoes, one of the key ingredients – unstable upper level air – is not quite behaving as predicted. So that means forecasters have less an idea of when and where the bad weather and potential twisters will hit, said Corey Mead, a meteorologist at the center. By Wednesday afternoon, the storm prediction center massively expanded its Thursday watch area to include Ohio, Indiana, Kentucky, Tennessee, Arkansas, Louisiana, Mississippi, Alabama, Georgia, West Virginia and parts of Virginia, the Carolinas and most of Florida. All this comes on the heels of one of the worst tornado years in U.S. history. Tornadoes in 2011 started the earliest ever – New Year’s Day – killing 550 people, injuring 5,400 and causing $10 billion ((euro) 7.56 billion) in damage over the year, the most in U.S. history. The 2011 season had the most tornadoes in a single day and a single month on record. But if you ask tornado experts what that means for this year, they’ll answer that they just don’t know. Later this summer, meteorologists will meet in a special conference to try to figure out how to do that type of longer-term tornado prediction. And the National Weather Service is installing new radar for live forecasting, tracking and distinguishing of tornadoes. Those together mean that maybe in 2020 or so, meteorologists will be able to say watch out this season or relax a bit – but not just yet, Brooks said. 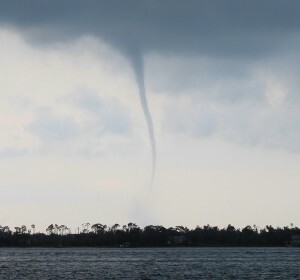 A new study by Columbia University professor Michael Tippett points out potential factors – vertical wind shear, updraft and a type of rainfall – that might help for long-range tornado forecasts. Another factor is La Nina, the flip side of El Nino. It’s a cooling of the central Pacific Ocean. Scientists have noticed a correlation between strong La Ninas and active tornado seasons – including last year. But it’s not so simple or clear-cut, Tippett and others say. The current La Nina is weakening so much it shouldn’t be a factor this year, several experts said. The new radar, called dual polarization, allows meteorologists to see through rain and dark and be sure if high winds are a tornado. In the past, meteorologists had to wait for ground confirmation. This won’t help with long-term forecasts but could save lives in real-time because forecasters can be more certain in their warnings, said National Weather Service meteorologist Paul Schlatter.